Aptera's lawn care in San Bernardino County helps you keep a well maintained yard year round. If you are like most people, you just don't have the time for lawn mowing, weeding, trimming, fertilizing and all that goes into creating a beautiful lawn. Thousands of customers every month rely on Aptera when they need a lawn care company in San Bernardino to care for their yard as if it were their own. Basic mowing service - Frequency of your lawn mowing will vary based on seasonality and grass type (see below for grass type info & identification). Most warm-season grasses including Bermuda and Zoysia should be kept at a height of 1.5 – 2 inches. Cool-season grasses including Fescue and Bluegrass do better around the 2.5 inch mark. Weekly or bi-weekly lawn service in San Bernardino will maintain these lengths during spring, summer and into fall. (Includes edging and clean up). Seeding and fertilization - to keep your lawn lush, green and healthy, seeding is done in the fall while fertilizer can be applied four or more times per year. Fertilization helps keep your plants healthy and strong so they can naturally fight off damaging organisms, bacteria, viruses, and fungi. Fertilizer granules should be spread across San Bernardino County lawns every 6-8 weeks during the growing season. For smaller areas of your yard the lawn care expert may decide that spray fertilizer is sufficient, though its affects do not last as long as granules. Most synthetic fertilizers have been formulated to release over time to provide a long-lasting solution to reduce the frequency you need lawn care in San Bernardino, Fontana, Rancho Cucamonga and Ontario. For homeowners looking to go green, organic fertilizers that include manure or crab meal are also available. Let a pro customize your fertilization plan fit for your yard and plants. Mulching - for most yards in San Bernardino, mulching should be done once a year, in early spring. Careful mulching helps your plants and shrubs retain moisture while adding needed nutrients back into the soil. Mulch also stops weeds from invading. You will have plenty of color tones to select from to match your flower bed and bushes, but Aptera lawn care services in San Bernardino County recommend only using hardwood mulch because it lasts longer and stays in place better than lighter woods. Weeding - Necessary on even the most well kept lawns in San Bernardino County, we recommend manual weeding and avoiding weed killers if possible. Some, like Mallow, Ground Ivy, Red Sorrel and Broadleaf Plantain are easier to manage than grittier species like Crabgrass and Carpetweed. Tip: Grass that is professionally seeded and fertilized and maintain a strong root system will actually force out weeds and significantly reduce their occurrence. Sprinkler System Maintenance - Irrigation is critical to ensure plants and grass are not over-watered or under-watered. Pets, wind, accidents and normal wear and tear can wreak havoc on sprinkler systems. Aptera lawn care services in San Bernardino County can repair and install all top brands of irrigation systems including Rainbird, Toro, Hunter, and Nelson. When choosing a lawn care company in San Bernardino, Fontana, Rancho Cucamonga and Ontario, be sure to inquire about the experience of the company's workers. Aptera lawn care professionals can tell you what breeds and types of plants and shrubs you have, how to take care of them, and how often services should be completed for optimal lawn health. Using the wrong tool or chemicals on your yard can be the difference between a beautiful, healthy yard and a brown, unsightly mess so it is critical you work with experienced, reputable experts. The best San Bernardino lawn care service doesn't need to be the most expensive either. Aptera has many providers with a long history of outstanding service, great customer care all at very competitive rates. Always make sure each bid for work provides a detailed explanation of the lawn care service they will provide including all material and labor costs. Most lawn companies in San Bernardino County will also provide à la carte services to supplement your own lawn care regimen. Select a breed that your neighbors have to avoid growth. For example if you choose Bermuda Grass for your lawn in San Bernardino County but your neighbors all have Carpet Grass it will be difficult to keep them separate for long. 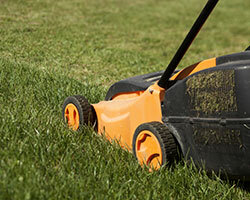 We try to schedule lawn services in San Bernardino County on the same day each week. Notification is provided for scheduling changes or conflicts. Are Lawn Care Companies in San Bernardino, Fontana and Rancho Cucamonga Required To Be Licensed? Federal law requires licensing for any professional who applies pesticides. Lawn service companies in San Bernardino who do not work with pesticides generally do not need a license. Great lawn service in San Bernardino County will leave you with a thriving lawn that reduces allergen-contributing particulate matter, provides erosion control, and acts as a natural water purification system. Using a professional lawn service in San Bernardino from Aptera to improve the health of your yard can save you time and even money so get started today. San Bernardino lawn care costs $678, lawn mowing service costs $301. Fontana lawn care costs $716, lawn mowing service costs $318. Rancho Cucamonga lawn care costs $636, lawn mowing service costs $283. Ontario lawn care costs $746, lawn mowing service costs $332. Victorville lawn care costs $670, lawn mowing service costs $297. Rialto lawn care costs $732, lawn mowing service costs $325. Hesperia lawn care costs $605, lawn mowing service costs $269. Chino lawn care costs $711, lawn mowing service costs $316. Chino Hills lawn care costs $735, lawn mowing service costs $327. Upland lawn care costs $642, lawn mowing service costs $285. Estimated San Bernardino County lawn care costs include all labor and equipment including mowers, hedgers, pruners and weed killers/pesticides. Does not include the cost of mulch or fertilizer.